What is The Actual Difference Between Sunscreen vs Sunblock? What is The Actual Difference Between Sunscreen vs Sunblock? Globe Trooper > Community > What is The Actual Difference Between Sunscreen vs Sunblock? What is The Actual Difference Between Sunscreen vs Sunblock? Sunny days are double-edged swords. They make exploring new places infinitely more enjoyable, but they also cause nasty skin damage. It was only a year ago when I had surgery on my head to remove skin cancer caused by Australia’s harsh sun. So it’s about time I read-up and shared my interesting findings. Did you know that UV rays can damage your skin even when you’re in the shade? And that those same rays are 500 times more abundant than the rays that burn you? Well surprisingly enough, there is a difference between sunscreen vs sunblock. Sunscreen soaks into your skin and absorbs the sun’s ultraviolet (UV) rays before they damage the skin. Sunblock sits on top of the skin and reflects or physically blocks the sun’s UV rays before they reach the skin. Remember when you were young and your mum made you put pink zinc all over your nose? Well, that was sunblock. It sits on top of your skin to create a barrier between you and the sun (and make you look very cool at the same time). Whereas today, the majority of products on shelves are sunscreen; they soak into your skin and become transparent. However, always read the label to find which UV rays are covered. Manufacturers often interchange the terms ‘sunscreen’ and ‘sunblock’, so don’t rely on the product’s name. 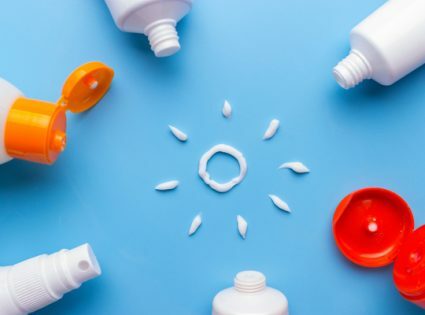 Most sunscreens only protect against UVB rays, but to be protected against both UVA and UVB rays, look for a ‘broad spectrum’ sunscreen or products that contain zinc oxide, avobenzone, titanium dioxide and ecamsule. This applies to fancy cosmetics too; just because they protect you from sunburn, doesn’t mean they’re slowing the aging process. For example, if it takes 10 minutes for your skin to burn without sunscreen, an SPF 15 product will give you 150 minutes in the sun until you will burn. However, this is a very rough guide because the sun’s intensity changes throughout the day. Therefore, to be conservative, your ‘time to burn’ estimate should be calculated when the sun is most extreme. Sunscreen does not increase protection (above the SPF rating) if you apply more layers. For example, if you apply an SPF 30 sunscreen over an SPF 15 moisturizer, your total protection is NOT SPF 45, but rather SPF30. In fact, combining certain products can degrade the level of total protection. Studies show that most people apply between 20% and 50% of the amount required to achieve the advertised SPF rating. That means a real-life application of SPF 30 may only provide SPF 6 to 15. In this case, applying additional layers would actually improve the SPF level, but only up to the advertised rating. Sunblock, which provides a physical barrier, may provide more protection with additional layers, but unlike clothing, layering sunblock doesn’t work well in practice. Sunscreen must be absorbed into the skin to soak up UV rays and provide protection. If old sunscreen, which has lost its protective properties, is still in the skin, new sunscreen will not be absorbed properly. Therefore, reapplying will only be completely effective if the old sunscreen is removed. Instead, you should really start with an SPF factor that will protect you for the entire length of exposure. Through activity, sunscreen may be washed off by perspiration or water, so reapplication may prove somewhat effective, but only if the skin is dry. Both SPF and UPF ratings refer to the amount of UV protection. The law of diminishing returns applies here: as the SPF or UPF rating increases, the increase in protection gets smaller (see below). Experts recommend anything above SPF/UPF 15. After that, choosing a rating should be based on how long you expect to stay in the sun and how quickly you get burned. If you’re planning to go in the pool for an hour or two, an SPF 15 will do, but if you’re out in the field working for long hours or on an outdoor expedition, SPF 40 or 50+ would be the best.